New houses improve the neighborhood. WCA’s Neighborhood Revitalization program buys homes in distressed neighborhoods and constructs beautiful new homes that are sold to graduates of the Housing Counseling & Money Management Center. 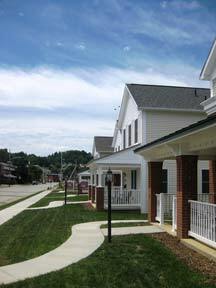 WCAs Neighborhood Revitalization Program works to acquire properties in distressed communities. Once acquired, the subject properties are demolished and reconstructed as three-bedroom homes available for purchase by county residents who have chosen to enroll in the Housing Counseling & Money Management Center, which offers homebuyer education and pre-purchase counseling. Westmoreland Community Action has renovated or reconstructed homes in the following neighborhoods: Greensburg, Jeannette, Mt. Pleasant, Claridge, Export, Latrobe, Monessen and New Kensington. 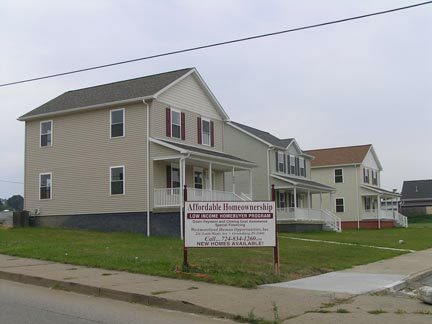 Eight houses have been completed in Monessen as part of the Knox and Reed Avenue Rehabilitation Initiative, and six have been sold to income eligible participants of the Westmoreland Community Action’s Housing Counseling & Money Management Center. Each of the two-story houses feature three bedrooms, one and one-half bathrooms, a front porch and high-efficiency heating and air conditioning systems. All homes are carpeted. For more detail download this brochure. Westmoreland Community Action is partnering with the City of Jeannette to complete a large scale PHFA and HOME funded housing impact project. 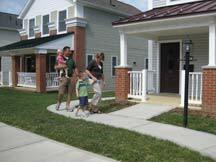 WCA will lead the project to reconstruct twenty-five continuous single-family homes for resale. This project involves building 23 single-family homes and 18 townhouses between the 300 and 400 blocks of South Sixth Street from Bullitt Avenue to Cassatt Avenue. The goal is to completely rebuild that area into an urban neighborhood. Two houses have been completed in New Kensington with both having been sold. These homes were acquired and renovated thru a HOME funded partnership between Westmoreland Community Action and the City of New Kensington. One house has been completed in Latrobe, this home was funded thru a HOME program partnership with Westmoreland County, Westmoreland County Housing Authority and Westmoreland Community Action. The house has already been sold to an income-qualified participant of Westmoreland County Housing Authority. Two homes have been completed with the assistance of ICTC students. The first house located on a half-acre lot in Brenizer in Derry Township has been sold. The other property, which has sold, is located on a one-quarter acre lot in the Village of Baggaley. One three-bedroom home has been completed in West Newton. Contact Westmoreland Community Action for more information on Neighborhood Revitalization. The Housing Programs are funded through the Department of Housing & Urban Development, the PA Department of Community & Economic Development, the Westmoreland County Department of Planning, and various corporate and private donations. Join WCA to Stand Against Racism!